A plate heat exchanger is a device that uses metal plates to transfer temperature from one liquid to another. Using a circulation pump, fluid is pumped over the plates from opposite directions allowing the heat transfer to occur. The major advantage to a plate style heat exchanger is the amount of surface area contained within the unit. The thin plates stacked on top of each other allow the fluid to contact a large service area while keeping the size of the heat exchanger relatively small. 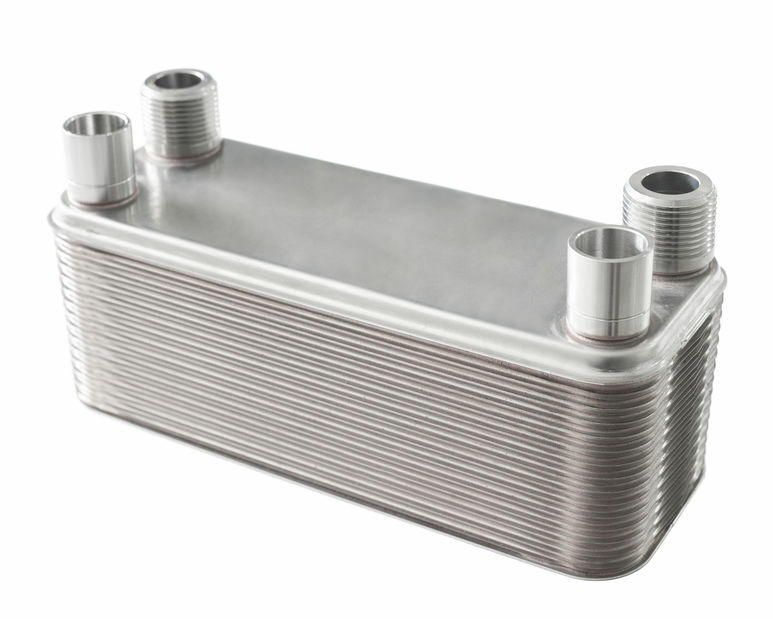 Small brazed heat exchangers are commonly used to heat domestic hot water. Their small size and great performance makes them a popular choice for many homes. This 50 plate brazed heat exchanger is used to heat my entire home. Hot water is pumped from an outdoor wood furnace through the heat exchanger. The heat exchanger then transfers the heat from the outdoor wood furnace to my homes baseboard heating system where the hot water is used to heat my house. By using this system, I turn the home boiler temperature to zero but still use the zoned thermostats to pump hot water through the baseboards heating the house. The heat exchanger takes the place of the boiler so now I just burn firewood instead of costly fuel. The red circulation pump in this picture is used to pump water from the outdoor wood furnace though the brazed heat exchanger. The water then travels to my hot water heater where another heat exchanger heats my domestic hot water. The water is then recirculated back into the outdoor wood furnace to be reheated by the wood fire. 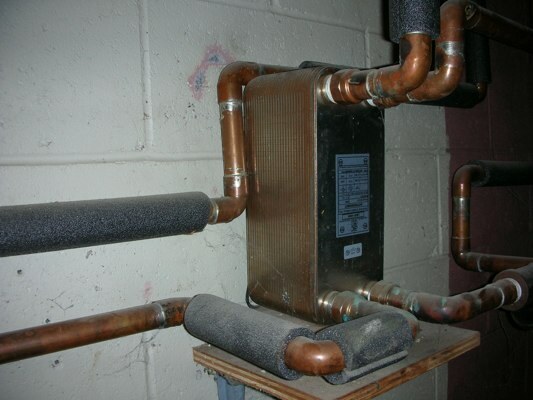 To heat your domestic hot water, two styles of heat exchangers are generally used. A brazed heat exchanger or a sidearm heat exchanger. Some installations use a small 10 or 20 plate brazed heat exchanger plumbed into the cold water supply that feeds the hot water heater. Using this method, the cold water supply is heated by the heat exchanger before it enters the hot water heater. Brazed heat exchangers can become clogged with calcium, rust or other deposits found within your water. 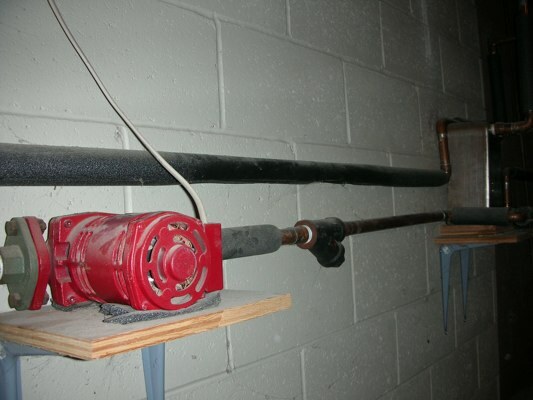 To prevent this, most installations use a coupling or quick disconnect to allow the heat exchanger to be removed and cleaned. If you have hard water, the heat exchanger may have to be removed yearly to clean it out. A dirty or clogged heat exchanger will dramatically reduce its performance. The sidearm heat exchanger uses a thermosiphon process to slowly circulate water though the heat exchanger without the use of any mechanical pumps. The recovery rate of a sidearm heat exchanger is much slower than a plate heat exchanger but they are less susceptible to becoming plugged by water sediments. The cost of a plate heat exchanger is generally based on the amount of plates the unit contains. When used in conjunction with an outdoor wood furnace, they can be an effective way to heat both your home and your domestic hot water. Before purchasing one, look at the different styles and options and choose a size that will effectively heat your intended purpose.